The book is about a couple who reminisce on their love and life together on Earth with only 90 minutes of oxygen left. “Hooray! Some absolutely dream casting for my novel,” Khan tweeted earlier today. “Beside myself with excitement” she continued. However, this isn’t the first time the British breakout stars have united. Long before rocking the Met Gala red carpet together (and fuelling many rumours of dating), the pair have actually been good friends for a while, dating back to their days as students of the Identity School of Acting. 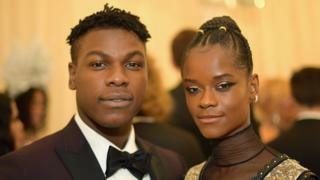 Stars Wars actor Boyega told The Grio in March that he and Wright would hang out at McDonald’s after classes and speak about their dreams and visions for the future. Little did they know they’d end up in some of the biggest films of the decade. “I felt Letitia was the best thing in Black Panther. She was fantastic. Every time she came onto the screen, my heart was uplifted,” he continued. Boyega will reprise his role as Finn in Star Wars Episode IX which is expected to be released in December 2019. He will also be providing the voice of Bigwig for the new Watership Down miniseries, airing on BBC One this Christmas. Wright will also reprise her role as Princess Shuri in the Black Panther sequel and the Avengers film coming next April. Mike Cahill will direct Hold Back the Stars. His most notable work, Another Earth, won two awards at the Sundance Film Festival in 2011.